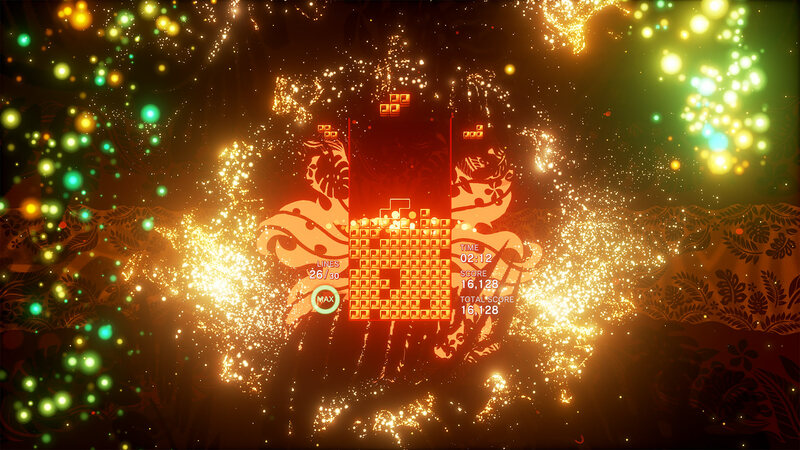 Tetris Effect is a rare but perfectly executed combination of old and new, synergising the relaxing and the intense while celebrating video games as an art. 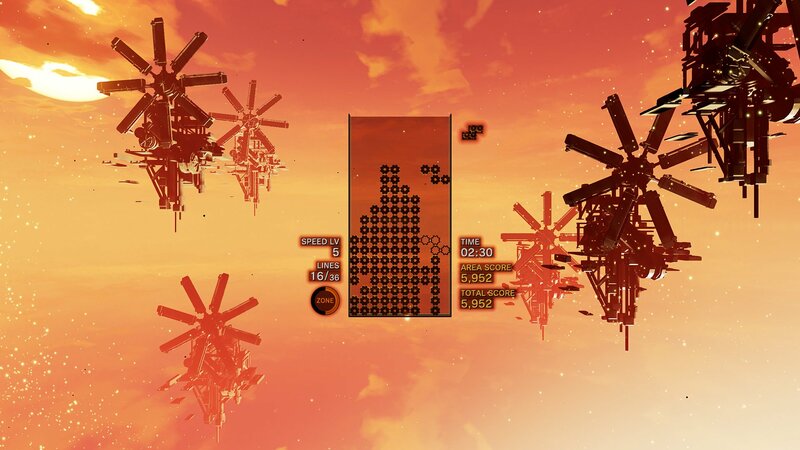 While Tetris Effect can certainly be played on a flat screen on your PlayStation 4 and still offer a great experience, it’s the addition of virtual reality that helps this retro classic transcend into a peek at the future of entertainment. Thanks to the bold vision of industry legend Tetsuya Mizuguchi, Enhance Games’ second foreray into VR is no less masterful than Rez Infinite. While it might be difficult to get excited for a Tetris game in 2018, the incredible score and mesmerising visuals add an unexpectedly magical layer on top of the retro arcade game, reimagining a classic as something fresh and new again. It also manages to do this without taking away from the original formula at all, making it one of PlayStation VR’s greatest and most accessible titles to date. You’d be living under a rock if you’ve never heard of Tetris before. Tetris is without a doubt one of the most iconic franchises in video game history, providing players with endless upon endless hours of puzzle matching goodness. Ever since its inception in the 1980s, Tetris has had more releases than you can count, where developers are constantly adding additional modes or tricks to the formula. However, Tetris Effect doesn’t try to change the formula or gameplay at all. It only seeks to enhance it. Tetris at its core is a simple formula that’s easy to learn with depth, complexity and difficulty that allows players of all backgrounds to grow their skills as you progress through its colourful block placing spell. In fact, it’s so much of a spell, it can be really easy to lose hours in the day while your tunnel vision is laser focused on pre-emptively anticipating your next move. It’s a small element of the experience that seems to have caught Mizuguchi’s eye because the decision to bring Tetris to virtual reality places you in a space of solitude allowing you to fall into your zone and focus on the task at hand… blocks! Mizuguchi achieves this transformative ride by merging the foundational, yet untouched design of Tetris with his signature rhythm-based mechanics and otherworldly soundtrack and juxtaposing it with beautiful visuals that will stick in your mind long after you have removed your VR headset. Moving, rotating and placing blocks in your box will dynamically trigger audio queues that add layers to the futuristic but zen-like electronic score, creating a feeling of interactivity that seems to be exclusive to Mizuguchi’s discography. It’s an effect that was present in Rez Infinite, where there were so many instances that I was slipped into a head-bop motion with a creepy big smile on my face. It’s a magical feeling that I’ve only really come to discover in VR games that utilise the soundtrack to its strengths. Mizuguchi also uses his strength in creating breathtaking visuals to transport the player to a far away dimension as you kick back and save your universe from the next ‘a-block-alypse.’ I have played many VR games since PSVR’s launch in 2016 and while I have been consistently wowed by the visuals and the worlds the games are built on, Tetris Effect continuously matches my reaction the first time I ever put a headset on. The visuals and backgrounds transition into each other perfectly, creating one of the most absorbing motion images I have seen in any medium, further hammering in that vision of immersing the player in the experience. The game’s journey mode takes you on an odyssey through 27 very unique levels, each with their own look and feel, making each level feel like something completely different from the last. Once completed (it took me a couple of hours), there are different modes and difficulties unlocked, which encourage further replayability. 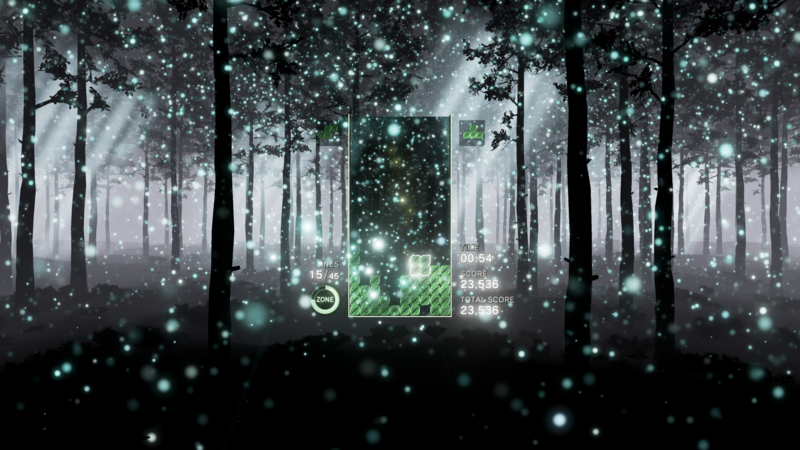 The Effect mode is a collection of different Tetris play types, which interestingly offer a different feel to the gameplay, adding a nice change of pace if you want a break from the current mode you’re playing. Even without the VR integration, this is one of the most best and feature-rich renditions of Tetris that I’ve ever played and I haven’t really been vocal about the series since the version on the original Nintendo Game Boy. If I could add one criticism for the sake of criticism, I would have liked to experience this all with a friend in the same space. Tetris has had fantastic multiplayer modes in the past and I feel like that would be a pretty juicy cherry on top of an already phenomenal game, especially given the fact that I am always aching to share these moments with another person. The best version of Tetris yet! There is not much else to say. Like I said earlier, it’s hard to get excited for a Tetris game, especially given how many iterations the series had. But using Mizuguchi’s brilliant vision in creating immersive and transformative experiences by merging gameplay with rhythm and visuals, Enhance Games have created the best version of the game since the originals. However, the game doesn’t just stand as the best in its series, it’s also one of the best VR experiences you can get, sitting alongside its older brother Rez Infinite and very quietly, one of the best games of 2018. Period. I sound like a broken record, but nothing I can really describe will get you adequately itching to play it. You really need to try it for yourself to get what I mean when I say that the Tetris Effect is real!